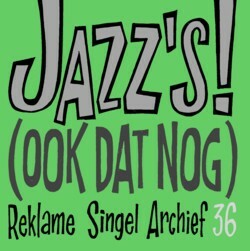 Inspired by Hans Koert LINK I began recording all my Dutch advertisement records with jazz music on them. Well, in most cases it is music that is vaguely related to jazz. Butnevertheless, it is a job that I wanted to do anyway, and I enjoyed the first CD-compilation so much that I did a second one. I am always amazed about what I get to hear when I listen to these advertisement records: there is so much variety in the sounds and music on these records that it is impossible to explain. My definition of an advertisement record is that it is a record that is made to advertise for a product or a service. But there are also records on my advertisement record shelf that do not fit this definition, but that I keep there anyway: records released on special labels, records made for special occasions, private label productions, etcetera. A typical record from this shelf, that is also on the CD, is a flexi record that was released for the Ca-Va Seul aktie. I have no idea what that was. 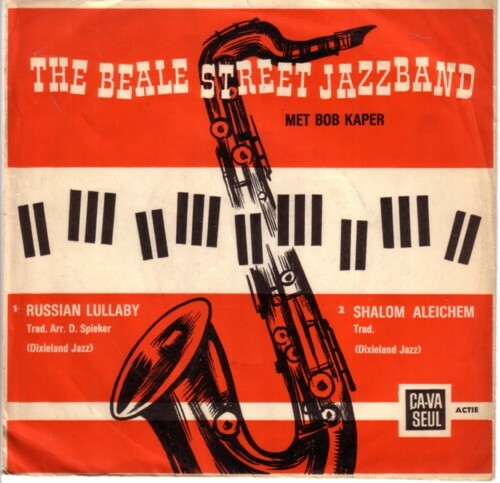 There are two songs on the flexi record by The Beale Street Jazzband, featuring Bob Kaper. I don’t know the band nor Bob Kaper, but the song Shalom aleichem is one of the very few Dixieland songs that I like to listen to. Well, as long it is not more than once a month. biotifool nummer ! senks u lot.